The teasing is done — Citroën just revealed their new concept car, unofficially called the "Citroen GT" and officially called "GTbyCITROËN," here at the Paris Auto Show and it's hot - it's also supposedly the first car "specifically designed to bring the virtual and real worlds together." What's that mean? Well, apparently visitors to the show can actually drive the car in a true to life simulator on the Citroën stand. But that's not the cool part. The cool part is that it's a joint venture between Citroën and Polyphony, the makers of Gran Turismo. And it sure looks it. Hit the jump for the press release. UPDATE: Not only do we get a chance to sit inside, but we also take a first drive of the GTbyCITROËN in GT5 Prologue! GTbyCITROËN: TAKING SPORTSCAR DESIGN INTO A NEW DIMENSION The amazing GTbyCITROËN is the first ever car to be specifically designed to bring the virtual and real worlds together. The car makes its global premiere at the Paris Motor Show where visitors can actually drive the car in a true to life simulator on the Citroën stand. GTbyCITROËN, a joint venture between Citroën and the makers of Gran Turismo, was created for the eagerly anticipated 5th game in the multi-million selling Playstation series. 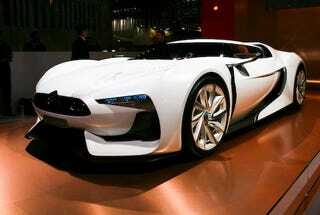 At almost five metres long, GTbyCITROËN packs the latest hi-tech racing equipment into an exaggerated sporty frame. Planted on 21-inch, diamond-effect, aluminium wheels, the car's gullwing doors, over-sized rear end with mobile spoiler, gaping air intakes and flat underside exude the qualities of an accomplished racer. With chrome chevrons on the smooth, aerodynamic, front end asserting the car's Citroën identity, the GTbyCITROËN is bursting with styling cues typical of the Company's creative flair. The sharp lines and sculpted body are emphasised by the white-to-grey flared paint work which gives the car a forceful look and an impression of speed - even when it's standing still. The sleekly muscled racer sports a large wraparound windscreen adding to the impact of the car's size and dynamic appearance. Penetrating blue LED headlamps and slim-line carbon fibre rear view mirrors - which appear to be suspended in mid-air - add to GTbyCITROËN's futuristic racing style. Premium materials used throughout GTbyCITROËN's hi-tech interior reflect the car's distinguished and refined personality. In contrast to its light body work, the cabin features a darker, more brooding colour scheme with two padded racing seats finished in black leather and fitted with four point harnesses. The dark leather, along with copper and steel touches inside the cabin and a low-slung driving position, create an opulent and powerful racing environment. Important on-board data is displayed via a red LED head-up display, allowing drivers to maintain focus on the track. In the game, the GTbyCITROËN showcases Citroën's dedication to the environment with an electric drive train powered by a fuel cell, totally eliminating pollutant emissions. Kazanori Yamauchi, President of Polyphony Digital Inc and creator of Gran Turismo, commented, "GTbyCITROËN shows how the worlds of virtual and real-life motoring can join together to create a truly innovative partnership. To see the GTbyCITROËN take shape in our game studios and then for real has been a truly unique experience - as our work normally stays in the digital world."